Ancient humans had the natural urge to document the world in which they lived, a fact that is evident in the cave paintings and carvings that still exist today. Why do rock paintings from various sites around the world all seem to depict the same things? Did the peoples of the prehistoric world have contact with each another? Is it possible that some were transported to far-flung locations in what our ancestors could only have described as “flying chariots”? Erich von Däniken, one of the best-selling authors of all time and regarded by many as the father of the ancient alien theory, continues his mission to uncover Earth’s ancient past—this time with more than 150 extraordinary full-color photographs—in Evidence of the Gods. This extensively illustrated book features never-before-seen photographs from his unique archive, compiled throughout decades of searching around the world for traces of the cosmic gods whom he believes came to Earth thousands of years ago. 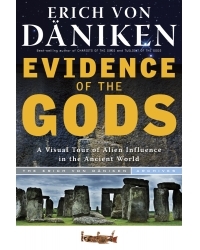 Evidence of the Gods offers the best and most impressive evidence to date, along with concise explanations for the images, to bolster the case that von Däniken has already been making quite convincingly for years. Evidence of the Gods is his most convincing—and thoroughly entertaining—work yet. Erich von Däniken is arguably the most widely read and most-copied nonfiction author in the world. He published his first (and best-known) book, Chariots of the Gods, in 1968. It was a worldwide best-seller and has been followed by 31 more books, including the recent best-sellers Twilight of the Gods, History Is Wrong, and Odyssey of the Gods (all published by New Page Books). His works have been translated into 28 languages and sold more than 63 million copies. Several have also been made into films. Von Däniken’s ideas have been the inspiration for a wide range of TV series, including the History Channel’s hit Ancient Aliens. He lives in Switzerland but is an ever-present figure on the international lecture circuit.